Used to be, I couldn't sell a lug rig to anyone. The early Mill Creek kayaks had lug rigs, and of course the Eastport Pram had a standing-lug rig starting in 1999. At the time, one prospective customer's reaction to the Pram's humble but effective sailplan was typical. He called it a "square rig." Gently corrected, he persisted. "No, I'm calling it a SQUARE rig!" he harrumphed, and what he meant to say was that he thought the boat would be a barkentine when it came to sailing upwind. He was wrong, of course; lug rigs are the most close-winded of any traditional type. Driving a carefully-rigged lugger with an expertly-cut sail, I can and have done horizon jobs on "modern" sloops that were sloppily set up and handled. My own devotion to the type never wavered. My very first sailboat rigging project, age 10, was a lugger. It was a cheap rubber raft, to which I fitted a thwart, plywood leeboard, broomstick mast, and loose-footed standing-lug sail cut from a blue cotton bedsheet. I was assisted in rigging by a 1950's-era Sea Scout manual, which assumed that a good scout should know how to set up a lug sail. My lug-rigged raft could get up a boiling bow wave on Gem Lakes. As far as lug sails go at Chesapeake Light Craft, public acceptance improved, and I'm even prepared to put a date on it. In March of 2005 our friend and colleague Geoff Kerr grabbed the front cover of WoodenBoat Magazine with his Oughtred-designed lug-rigged Caledonia Yawl. Around that time, the #1 question about every CLC sailboat shifted to, "Could it have a lug rig?" The lug is an ancient type of sail, my guess being that the Vikings invented it when sailcloth improved and they found they could brace their square sails around and sail upwind. Phil Bolger wrote that the lug sail is "the most powerful windward sail possible with primitive technology." To do any better upwind, you need stainless steel cabling to tension the luff of a jib. By the way, Bolger's book 100 Small Boat Rigs is the best book ever written about sailing rigs. Actually, I think it's one of the best books ever written about small sailing craft, period. The nomenclature of a balanced-lug sail. A lug sail is a quadrilateral shape, with a yard at the top. (Please don't call it a gaff.) There are three main types: dipping lugs, balanced lugs, and standing lugs. We won't linger over the oldest and historically most-used lug rig, the dipping lug. Dipping lugs were very common in working sailing craft, especially in Europe. They offer the most power, especially upwind, but require a highly trained and patient crew, so they are unknown in yachts. To tack, you must drop the sail, pass the yard to the other side of the mast, and rehoist. A good choice in a boat that doesn't need to do much short tacking. My drawings for an Everglades Challenge competitor show a dipping lug, to be deployed when there's a single long tack ahead. The dipping lug sail on this sliding-seat racer is deployed from a folding A-frame mast. Balanced-lug sails are the most popular type in the 21st century. You can read a complete guide to setting up a balanced lug sail, here. Balanced-lug sails always have a boom, and are distinguished by a tack that's positioned well forward of the mast. The sail area in front of the mast helps balance the sail area aft---thus the name---and so sheeting loads are lighter. The mast DOES cut into the sail on the "bad" tack, but nobody has ever established that luggers are much slower on that tack. The signal advantages of the balanced lug sail are the speed at which it can be hoisted and stowed and the ease of reefing. You don't need a boom vang because the boom is locked horizontally by luff tension, eliminating horsepower-robbing twist in the sail. The center of effort (a very approximate geometric location of the sail's thrust) is comparatively low for a given amount of sail area, meaning that there's less heeling moment for a given amount of thrust. This isn't guaranteed---I've had builders with overbuilt yards and the extra weight canceled out the gains. But a 65-square-foot lug sail will create a noticeably more stable boat compared to a 65-square-foot triangular sail. The Passagemaker Dinghy has a balanced-lug, while the Eastport Pram (right) has a standing-lug. The standing-lug looks like a balanced-lug at a glance. The difference is that the tack of the sail is fastened at or near the mast. The reasons to choose this rig over a balanced-lug are somewhat incremental. The spars tend to be short, making them easy to stow (say, in an Eastport Pram). On my drawing board standing lugs usually appear when the boat's layout demands a mast placed far forward in the boat, such that the balance-lug rig would shift the center of effort too far forward. You can also rig a standing lug without a boom, which is nice if you hate getting clocked in the head. To those of us who know the secret lugger handshake, lugs are an obvious choice for pleasure sailing. Why aren't luggers more popular? Unfamiliarity is the main culprit. While comparatively simple, getting a lug sail rigged for best performance requires a certain artfulness. Most luggers that I see lack enough tension in the outhauls on the boom and yard, so that the sail is too baggy. Those boats don't go to windward well, reinforcing the incorrect notion that "traditional" rigs have innate deficiencies upwind. Once you hoist the sail, you need loads of downhaul tension, too. Even if you get enough tension at the beach, the halyard and downhaul will stretch under way and need to be tended often. Another troubling misconception is that traditional sails are just flat sheets of canvas. All sails are wings, and require careful shaping to generate lift, much less drive a boat upwind. There is a careless tendency to dismiss the sailmaker's art in traditional smallcraft. The lug sail in a $1000 dinghy needs as much thoughtful three-dimensional shaping as a mainsail on a million-dollar racing yacht. Years ago, I had a lot of trouble getting CLC's lug and sprit sails made because the volume name-brand sail lofts didn't have design software that covered quadrilateral sails! (I suspect they've fixed that by now, but at the time those sails always came out too flat.) CLC's longtime sailmaker, Douglas Fowler, is absolutely obsessive about broadseam and the "round" built into the head and foot of the sail. The combination of ultra-modern synthetic sailcloth and hand-wringing over sail shape means that you don't have to give up anything in performance in a modern lugger. Northeaster Dory with the stock balanced-lug rig. Passagemaker Dinghy with the same balanced lug sail. The deep round in the foot of the sail looks good on paper AND on the water, but beware: you need a much stiffer (and thus heavier) boom. Lacing the sail to the boom adds a lot of support, so the boom can be lighter, and makes it easier to control the draft of the sail without very high outhaul and downhaul tension. I admit, I prefer the looks of the unlaced foot. For years, the Skerry, Passagemaker, and Northeaster Dory have shared the same 62-square foot balanced-lug sail. This is just a coincidence of the three boats having similar displacement and stability characteristics, though it DOES help on the cost to have a stock item. All have slightly different halyard and downhaul attachment points, to shift the sail so the center of effort lines up best. A comparison of the Northeaster Dory with lug and sloop rigs. All things being equal, the jib makes the sloop faster on all points. But it's fussier to rig. Many rigs were considered for PocketShip, including a lug yawl. This version would be less expensive than the sloop and quicker to set up, but wouldn't be as fast, particularly upwind. Jibs function like leading-edge slats on aircraft wings, accelerating the flow around the lee side of the mainsail. Drop the jib on a PocketShip sloop and the boat feels sluggish. Still, for a cruiser there are interesting advantages. Engineering the tabernacle for the cantilevered mast is the only major challenge here. 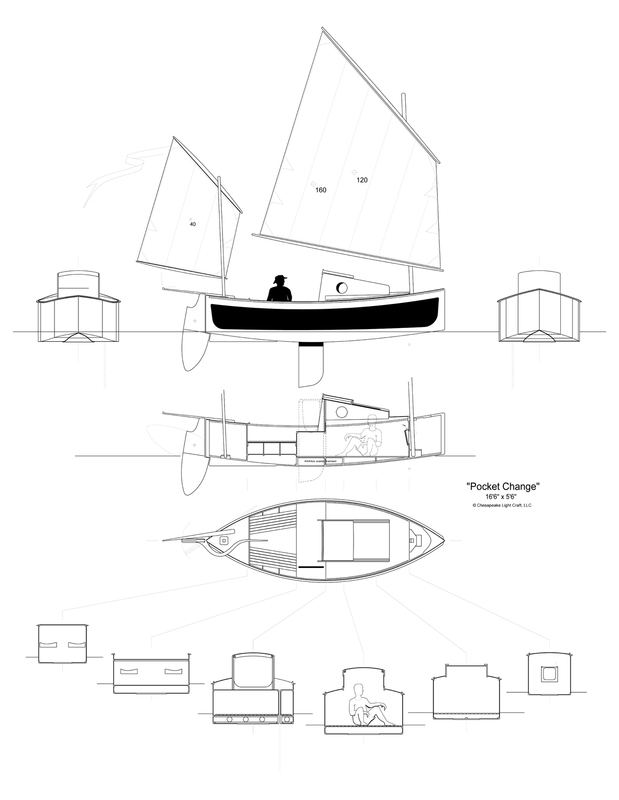 "Pocket Change" is a water-ballasted yawl with a daggerboard.